Projects could take place in Hong Kong, Mainland China or overseas, but must be self-initiated. Three rounds of vetting are available in 2018-19. Students should take note of the following schedule when submitting applications. 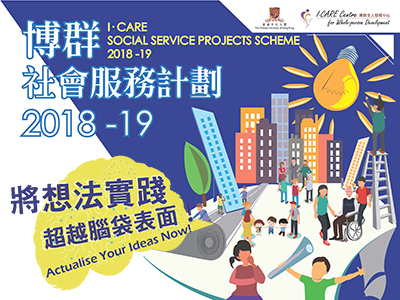 For more information about the I·CARE Social Service Projects Scheme, please visit here. Any enquiry could be directed to Miss He of this Centre at 3943 9859 (Tel) or athenahe@cuhk.edu.hk (Email). # Please click the image at the top-right corner to view the full poster. Copyright © 2019. All Rights Reserved. I･CARE Centre for Whole-person Development, The Chinese University of Hong Kong.